43 photos from 2017. Williamsburg was the capital of colonial Virginia 1699 - 1780. History then passed it by, As a result, some of its 17th and 18th century buildings survived, and their preservation or reconstruction led to the establishment of today's living museum. Costumed interpreters explain and demonstrate aspects of 18th century colonial life. But the difficult and sensitive issue of slavery is barely visible, in part because, not surprisingly, very few volunteers - especially African-Americans - want to act as slaves. On the other hand, there is - again not surprisingly - a plethora of eateries and gift shops. Overall I found Colonial Williamsburg an unsatisfactory experience, almost kitsch. Others may feel the same, as visitor numbers have fallen, and the museum is in financial difficulty. Welcome to Colonial Williamsburg, Virginia! 16 May 2017. 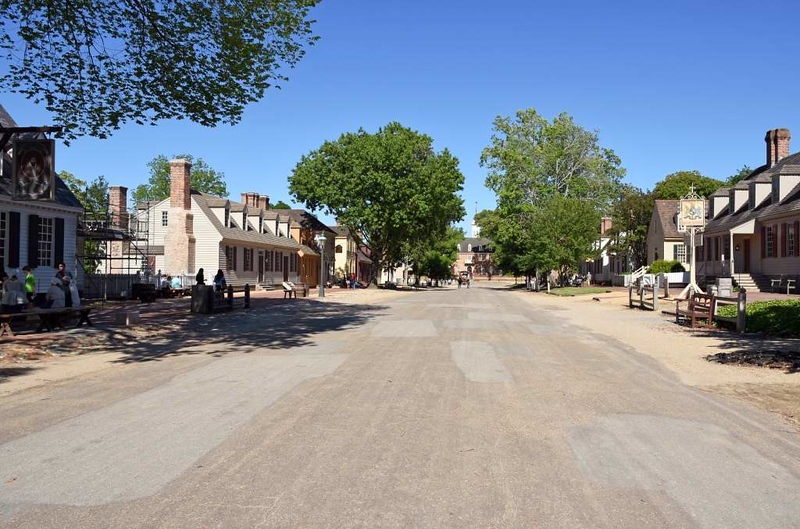 This view looks east along Duke of Gloucester Street towards the Capitol building. Williamsburg was the capital of colonial Virginia 1699 - 1780. History then passed it by, As a result, some of its 17th and 18th century buildings survived, and their preservation or reconstruction led to the establishment of today's living museum.